We’d love your help. 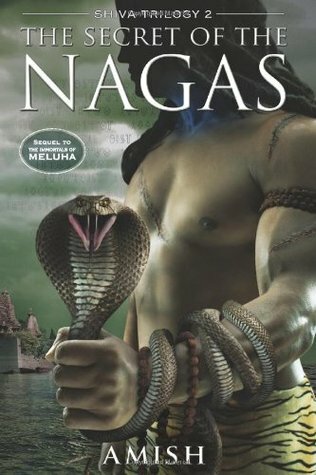 Let us know what’s wrong with this preview of The Secret Of The Nagas by Amish Tripathi. The hunt is on. The sinister Naga warrior has killed his friend Brahaspati and now stalks his wife Sati. Shiva, the Tibetan immigrant who is the prophesied destroyer of evil, will not rest till he finds his demonic adversary. His vengeance and the path to evil will lead him to the door of the Nagas, the serpent people. Today, He is a God. The Secret of the Nagas. To ask other readers questions about The Secret Of The Nagas, please sign up. Can I read it online .? Chandreyee Of course you can. A bit of googling may help you to find a free PDF version of all the three titles in Shiva Trilogy. As much as I wanted to see Shiva as the normal-guy-turned-hero, the whole special attention he gets as chosen one puts me off. What intrigues me abt the second book is the good vs evil discussion, would like to hear opinions about what the book discusses about evil should exist and should be balanced out at the right time? It isn't often one comes across a book by an Indian author, with a sequel. It is even rarer when the said sequel might just be better than its predecessor. Tripathi once again delves into Indian mythology and spins a fascinating tale around many of the names heard in tales told at our grandmothers' knees, portraying them as mere mortals. Last left, Shiva was about to launch an attack on the dreaded Nagas to avenge Brahaspathi's death. The book's blurb gives you enough indication, and then some, t It isn't often one comes across a book by an Indian author, with a sequel. It is even rarer when the said sequel might just be better than its predecessor. Tripathi once again delves into Indian mythology and spins a fascinating tale around many of the names heard in tales told at our grandmothers' knees, portraying them as mere mortals. Last left, Shiva was about to launch an attack on the dreaded Nagas to avenge Brahaspathi's death. The book's blurb gives you enough indication, and then some, that Shiva's plan might not be that easy to execute. His desire, and ours, for answers takes him all across India in this book, with the city in focus being Kashi. I'll give the book this, the author has good command over the story and doesn't let it meander, with something or the other always afoot. Filled with secrets, shocks and betrayal, this book is a page-turner from start to finish. The reveal of the Naga's identity was shocking, to say the least. I DID NOT SEE THAT COMING, PEOPLE! The "secret" of the Nagas, however, was something I had long suspected so I wasn't blown away by the "cliff-hanger". As for that Master Pupeteer, I think it's (view spoiler)[Bhrigu (hide spoiler)]. There's a suspicious character if there ever was one! But, the book is not perfect either. Many issues are brought up and then never addressed again, or explained properly. For example, the awfully gross "ritual" the Branga people perform in Kashi - what is THAT about? Or this mysterious plague that seems to affect them, nothing is mentioned as to what it is or why it is happening or how it started and it is never brought up again after that chapter. Sati annoyed me a bit in this book. I don't know about you, but I wouldn't be OK with leaving my 6-month old son and going off to fight lions or planning a break-in because I'm wondering what the King of Kashi is up to when he disappears mysteriously into his palace every now and then (BOUNDARIES, woman!). Anandamayi, however, was a delight to read about. I couldn't help but grin every time that feisty, saucy girl sauntered onto the page! The author often uses the story to put forth his opinion on many issues - like Karma, ethics, consequentialism, existentialism and the balance of Good and Evil. Though it is clearly intended to make you think, sometimes it does get a bit too much. What I also found jarring was the use of certain words/phrases that didn't quite match with the era the book is set in. I get that the author has tried to give the story as modern a take as possible, but I can't quite digest the fact that these people know of "radio waves" and "accumulator machines" OR that they say things like "You're a 180-year old virgin??" (Was anybody else reminded of Twilight here? No? Just me? OK.) and "I never understand their mumbo-jumbo". But maybe that's just me. I feel like I just finished reading one of the Star Wars installments. With Shiva as Anakin, Sati as Padme, unexplored regions with strange inhabitants with secrets and continuous travels... The book was just too formulaic. That is not to say that it is not a good read - it is just that I was expecting the second book to be better than the first in some ways at least, and quite frankly, it is not. How Amish managed to construct a whole sequel on such a flimsy basic premise is beyond me. (view spo I feel like I just finished reading one of the Star Wars installments. With Shiva as Anakin, Sati as Padme, unexplored regions with strange inhabitants with secrets and continuous travels... The book was just too formulaic. That is not to say that it is not a good read - it is just that I was expecting the second book to be better than the first in some ways at least, and quite frankly, it is not. Overall, the story is good, the new take is innovative and refreshing at times, but the narrative style, especially during the abundant action sequences is amateurish and repetitive. While the book makes for a fun fast read, I cannot in good conscience recommend it without telling that anyone who picks up the book looking for literary enjoyment is going to be terribly disappointed, but if all that is needed is a way to pass a few hours, then it might be worth it. Surely it will make a good movie someday, with the disappointing and predictable plot twists that is characteristic of most Bollywood movies. As I already mentioned, this book is strictly not for those who believe in Lord Ram's ways of ruling, saivism or Shiva Puran and that intrigued me to proceed with the sequel. And it did not disappoint me, not even a bit of it. The jaw-dropping connection between the Nagas & Sati took me to the state of excitement, anger, shock, disappointment, sympathy, grieve, raging and all emotions at once for the abandoned Nagas. When the ultimate secret was revealed, i sat dumb-struck. All my guesses went in vain. What really captivated me was that the secret itself was speaking about illusions or Maya. What intrigues me now to read "The Oath Of Vayuputras" is the secret that Krittika shares with Ayurvati and the secrets that the secret itself should reveal to Shiva. Undoubtedly, this book has paved way for some grand magnificent ending to the story of the masculine tribal man, who elevated him self to be the MahaDev. And The reverbration of "Har Har Mahadev" won't stop until I finish of oath Of the Vayuputras. really....?? did I read it?? I mean...seriously???? It seemed that the theory Amish Tripathi tried to write in his book wasn't quite clear to himself....hence the story wasn't quite linked....the loose threads kept to make the books interesting seemed to lost with the plot and remain lost even in the end....and don't make me start with the Vasudevs crap....I mean they are supposed to be pandits, right?? they do pujas in the temples....then how the hell do they know about high frequency radio wavelength, when Brahaspati the scientist doesn't even know about it?? I still maintain that this book is a great concept. Taking an Indian God like Shiva with multiple facets to his persona and coming up with such an elaborate tale takes a different kind of imagination. Having grown up hearing stories about Gods like Shiva, Vishnu, Rama, Krishna etc curiosity was the one thing that drew me towards the first book in the series. But the curious thing about this book is that even though you want to be surprised and confronted with out of the world conspiracy theories I still maintain that this book is a great concept. Taking an Indian God like Shiva with multiple facets to his persona and coming up with such an elaborate tale takes a different kind of imagination. Having grown up hearing stories about Gods like Shiva, Vishnu, Rama, Krishna etc curiosity was the one thing that drew me towards the first book in the series. But the curious thing about this book is that even though you want to be surprised and confronted with out of the world conspiracy theories with each turn of the page it is the very same predictability that keeps you hooked. Be that in the case of Shiva's marriage, his friendship with Nandi, Bhagirath and Veerabhadra or any other stories associated with his myth, the fun part of the book is seeing how each story fit into place. For me this was the fun part but now that brings us to the next question. What about a person who has not yet heard of Shiva or his story? Will this person find the book enjoyable? This is not a book for such a person. In such a case the person tends to evaluate the book on the basis of the writing and that leaves much to be desired. Amish Tripathi is more of a conversationalist than a writer. His creative energy seems to be high when his characters are engaged in conversations but that doesn't also prevent his dialogues from being a little childish. All the philosophies about life, good and evil etc are engaging but it has a distinct Yoda to Skywalker kind of conversation aura that you learn nothing new from the venture. One thing I did find odd though was the ease with which people fall at the feet of Shiva. He is supposed to be an ordinary man in this book. But that promise is not delivered, it seems Shiva became a legend because he was already a legend which doesn't make the slightest sense. Also even the strongest opposition is won over by Shiva's humility, without even a second thought. The constant reference to India is also nerve racking as there was no India at that time and that undermines much of the credibility in this story. The story however is more or less the same. We have Shiva who is prophesied as the destroyer of evil but having trouble understanding the true evil. Since the Chandravanshi threat has been taken care of the only thing that can now be considered evil is the feared Nagas. But are the Nagas truly evil or are they just misunderstood?. As Shiva searches for answers he comes across shocking revelations that may change everything. And that pretty much sums up my feelings for this book – not love, not hate. Just apathy. It hurts me that I cannot give this book a better rating. All things considered, The Secret of the Nagas deserves at least a three, for the sheer ingenuity of its concept. But my ratings are always based on how intensely a book affects me, and as frustrating as it is to admit, this book did not affect me in any way. I tried; I really, truly tried. Considering how disappointing the first book was, I kept my expectations low this time around. I pretty much ignored the clumsy writing and the clichéd characterisation, keeping my focus only on the story. I hoped that would make me like this book better than its predecessor. Battles were being fought, and I didn’t care. People died, and I didn’t care. Surprises were being revealed, and I didn’t care – probably because I figured them out way early. (view spoiler)[(I deduced by page 50 that the Naga man was probably Sati’s first-born son. And I always suspected Brahaspati was alive, since his body was never found. I mean, isn’t that the golden rule of Bollywood??) (hide spoiler)] Even the humour felt painfully contrived. I would still say this: The imagination gone into crafting this story is spectacular. So please don’t let my review change your mind about giving this one a go. So the book didn’t work for me. Sad. Doesn’t mean it won’t work for you. Besides, The Shiva Trilogy is multitudes above the insipid, tacky love-stories that so many Indian authors regularly churn out. And for that alone, it at least deserves to be read. The characters are strong, the plot is well developed and the description is wonderful...I felt mythology come alive all around me! The second book 'The Secret of the Nagas' follows 'The Immortals of Meluha' the first book in the 'Shiva Trilogy' series. A brilliant sequel to the first novel of the Shiva Trilogy. I could not have asked for more. Amish has done a wonderful job to bring out this fast-paced and action packed thrilling ride complete with drama, action, devotion, loyalty, philosophy, spirituality and vengeance spiced up with romance, conspiracy and deception. It took the epic to a new level. Every character in the The second book 'The Secret of the Nagas' follows 'The Immortals of Meluha' the first book in the 'Shiva Trilogy' series. A brilliant sequel to the first novel of the Shiva Trilogy. I could not have asked for more. Amish has done a wonderful job to bring out this fast-paced and action packed thrilling ride complete with drama, action, devotion, loyalty, philosophy, spirituality and vengeance spiced up with romance, conspiracy and deception. It took the epic to a new level. Every character in the book catches our interest. Shiva is destined for greatness and it is his karma to find evil. Additionally, he aims to avenge the death of his best friend by killing the evil Naga, known as Lord of the People by the Nagas, and bring end to evil by finally destroying the Nagas. His wise and brave wife Sati has been a true companion in this quest. But a bitter-sweet revelation of her past surfaces motivating Shiva to uncover the secret of the Nagas. What is evil? Can good exist without evil or are good and evil two sides of the same coin? The book tries to find answers to these questions. A wonderfully thought-provoking and fascinating sequel with a great plot and a fair share of twists and turns. Finally the book is out. For past one year we (and here I can talk about four of us) have been waiting for the release of this book. Checking every month and then on a weekly basis. Its one of the firsts in Mythological fiction in India based on God Shiva. For me Shiva is probably the most maverick of the Trimurti of Gods – Brahma, Vishnu & Mahesh – birth, life & death and comes across as someone so un-God like. He is not saintly or perfect, he does not follow rules, his anger is earth shaking, his lifestyle is bohemian, he follows his emotions, and he loves or hates to the extremes. Unlike Vishnu the charmer & his aura and Brahma with his multiple heads and books, Shiva represents the God of the free spirits, who do not believe in right or wrong but believe in him and only him. He smokes a pot, and enjoys his bhang, plays with snakes and drinks his poison. This review has been hidden because it contains spoilers. To view it, click here. I like how the story's been developed in this book. I found some things predictable, but am not complaining about those in any way. Very well written. Again, I couldn't put the book down till I was finished reading it. In some ways, the predictability is because of the fact that, once you're about a third into the book, it hits you that Amish has found this really cool way of retelling tales from Indian mythology; through an engaging, witty and insightful set of stories. You realise that you alr I like how the story's been developed in this book. I found some things predictable, but am not complaining about those in any way. Very well written. Again, I couldn't put the book down till I was finished reading it. You make this realisation at any point in the book. For me, it hit me when Kartik was born. Sati's second born. Amish conveniently named him Kartik. So my mind automatically told me there *must* have been a Ganesh too. And then all the pieces clicked into place. Sati's previous child, whom she was told was a still-born. The Nagas not being of standard human appearance. Daksha and Veerini's previous reactions. Most things that were left unexplained in some previous passages. But realising this does not take away much from the pleasure of reading the book. The way each character is developed by Amish and the way the story itself unfolds makes the book a very enjoyable read. What I particularly liked was the fact that Amish does a Kurosawa-esque justification of the actions of every character he portrays. You get to see the same story from each protagonist’s point of view, adding depth to each character. Also, this has to be said: there certainly is a feel-good aspect to these books. One that you’re willing to live with because (apart from the actual fact that it does make you feel good while reading the story) you’ve been transported back to some place in your childhood. And here, the security of knowing that good will (eventually) triumph over evil makes the reading more enjoyable. What I also am *extremely* thankful for, is that, nowhere in the book does the tone get preachy (that would irk me no end) or patronising. This is one of the few major reasons I’d disagree with anyone comparing Amish to Paulo Coelho. The extent of my liking for this book can be gauged by this: I’ve even managed to tolerate the constant chants of “Jai Shri Ram” throughout the book. The significance of this fact is that my personal opinion of Ram, is er.. Hmm. Well, this forum is not appropriate for me to start on that rant, let alone the kind of adjectives that might ensue. Suffice to say that my dislike for that character is quite marked. The one reason, I read through the series, though incomplete, is the very serious romanticized take on a mythological figure. Shiva, one of the most masculine, virile men in Hindu mythology provides the perfect hero to this epical narrative. The story isn’t very great, but is saved by the very magnificent characterization of Shiva. The only thing you, as reader, wants is to see him happily married to Sati, playing the hero, and fighting the bad guys. A major glitch I feel this book has is the ve The one reason, I read through the series, though incomplete, is the very serious romanticized take on a mythological figure. Shiva, one of the most masculine, virile men in Hindu mythology provides the perfect hero to this epical narrative. The story isn’t very great, but is saved by the very magnificent characterization of Shiva. The only thing you, as reader, wants is to see him happily married to Sati, playing the hero, and fighting the bad guys. A major glitch I feel this book has is the very confusing historical timeline. Amish Tripathi could have given some thought and importance to the actual (believed) sequence of events. The follow up to this book, the secret of the Nagas, lacks a perfect narrative. It’s a series of very predictable disclosures that unfold through a chain of events. The only surprise for me as a reader was the very last part of the text, where in typical television serial style; the dead come back to life. We wait for the third book in the series to see how this humdrum narrative comes to an end. My only favored element in the book, Shiva. You sure are a dude. in spite of not being enamored with the first book, i read the secret of nagas just to satisfy my curiosity of how the author managed to progress the plot in the book 2 of the trilogy. to cut a long story short, im disappointed. in the first book i could see glimpses of screenplay-ish writing and in this one im convinced that this series was written for a movie. maybe even with john Abraham as Shiva. no character in this book is completely evolved, including that of Shiva. as a result, there is in spite of not being enamored with the first book, i read the secret of nagas just to satisfy my curiosity of how the author managed to progress the plot in the book 2 of the trilogy. to cut a long story short, im disappointed. in the first book i could see glimpses of screenplay-ish writing and in this one im convinced that this series was written for a movie. maybe even with john Abraham as Shiva. no character in this book is completely evolved, including that of Shiva. as a result, there is no one character you root for. some of twists in the story are so bizarre that if feels very forced. in fact, it is almost like a vikraman movie (excuse if you don't watch Tamil movies) where everyone is good, no one is evil. the "secret of nagas" also turns out to extremely predictable. the language is still very amateurish and doesn't entice. even the complicated philosophies he tries to explain seem unoriginal and recycled. What a franchise!! Though this is not very gripping like the first edition i thoroughly enjoyed reading this books!! As i have said in my review for the first part that one should remove from his mind that shiva is god and proceed reading, then one can enjoy the book!! Author has to be appreciated for coming up with such a brilliant idea and i bow before his thought of fiction blended mythology!! At many places i felt like my hand was trembling with excitement! The starting chapters were not soo What a franchise!! Though this is not very gripping like the first edition i thoroughly enjoyed reading this books!! As i have said in my review for the first part that one should remove from his mind that shiva is god and proceed reading, then one can enjoy the book!! Author has to be appreciated for coming up with such a brilliant idea and i bow before his thought of fiction blended mythology!! At many places i felt like my hand was trembling with excitement! The starting chapters were not soo interesting, but the plot begins to unfold as it proceeds! The author was successful in taking me into a complete different world, which is the prime for any fiction/fantasy writer. I am very thankful and feel privileged to be a reader of this epic! Well Bose and I couldn't resist getting the sequel to The Immortals of Meluha. The first book ended abruptly in midst of a battle which was a clever strategy deployed by the author. But this sequel was worth a shot. The Shiva Trilogy 2: The Secret of The Nagas came with a expanded map of India showing us the territory of the "evil" Nagas. Rarely one comes across a sequel better than its predecessor. And this book can be surely counted as one of them. Every line of the book catapaults into opening Well Bose and I couldn't resist getting the sequel to The Immortals of Meluha. The first book ended abruptly in midst of a battle which was a clever strategy deployed by the author. But this sequel was worth a shot. Rarely one comes across a sequel better than its predecessor. And this book can be surely counted as one of them. Every line of the book catapaults into opening a new secret. Generally a book opens up with the author thanking his family and friends. This one opened up in a similar manner The lines were so few, but they sunk deep inside my heart ..
Apart from the main story-line of Shiva finding and destroying the Nagas. This book also had some small parallel stories which were equally interesting. Notable one was that of Princess Anandmayi trying hard to win over General Parvateshwar who had taken a vow of brahmacharya , an open-ended word of honour that can never be broken. The description of the gates of kingdom Branga [conjugate of Brahmaputra and Ganga] was nothing less than a fine example of an engineering marvel. The arrival of Ganesh and Kali left me speechless. Their character portrayal was simply way ahead for an Indian author. But what moved me the most was the very small story in 'The Curse of Honour'. The story was that of Parshuram which definitely reminded me of the honour killings rooted in our society. Hats off to Amish for this one ! Some of the awesome lines in this book were ..
"How does it work? How is it that I can hear your thoughts?" "Its a simple science really. The science of radio waves. Just like light, which helps you to see, there are radio waves to help you hear. While all humans can easily use the properties of light to see, most don't know how to use radio waves to hear. We are dependent on sound waves to hear. Sound waves travel much slower through air and for much shorter distances. Radio waves travel far and fast, just like light"
Truth doesn't ask for belief. It just exists. Let me hear what you think. There is god in every single one of us. What is the obvious corollary? There is evil in every single one of us. Exactly, there is god in every single one of us. And there is evil in every single one of us. The true battle between good and evil is fought within. The hump caused by the injury restricted Uttanka's right arm's movements. "You will not be able to battle a taller man." "I will die before retreating, My Lord," said Uttanka. "I have no use for soldiers who die. I need soldiers who will kill and live." And yet, you abandoned me. And yet, I am the monster. This review has been hidden because it contains spoilers. To view it, click here. I liked the first book of the trilogy, Immortals of Meluha, mostly because it was a fun read. It was interesting to see how Tripathi brought in Nandi, Veerbadra and other mythological characters to life. Hence I pre ordered this book. It was a disappointment. Shiva, from being a man confused of his destiny in the first book, becomes an all powerful superhero, almost like Captain Vijayakanth. He never gets hurt, none of his followers get hurt or killed (except for one janakaraj like character), no I liked the first book of the trilogy, Immortals of Meluha, mostly because it was a fun read. It was interesting to see how Tripathi brought in Nandi, Veerbadra and other mythological characters to life. Hence I pre ordered this book. It was a disappointment. Shiva, from being a man confused of his destiny in the first book, becomes an all powerful superhero, almost like Captain Vijayakanth. He never gets hurt, none of his followers get hurt or killed (except for one janakaraj like character), nobody is wrong but every one has different view points - it started resembling a tamil masala movie. From the first book, Tripathi builds up the image of the Naga as some one besotted with Sati / Parvati. So I assumed that he will turn out to be one of the asuras whom Sati kills, may be Makishasura. So it came as a jolt when it turned out to be Ganesha, who in all our myths has been a jolly good fellow, not the intense character that Tripathi makes him out to be. Personally it offended my Tamil senses that Murukan / Karthikeyan is shown to be a north indian prince. Most probably in the next book, Murukan will settle down to rule the Nagas (who I assume are Dravidians) as Shiva goes back to his abode in Kailash. I have always thought that Murukan was a Tamil king who was worshipped by Tamilians and the Saivite religion later accommodated him into their pantheon. I understand that my assumption is a myth too. No one can be sure of whether it happened like Tripathi wrote or as I assume, still it grates to have my assumptions questioned without the other side giving a logical reason. All in all the trilogy is an interesting idea that could have been a Umberto Eco kind of novel, but ends up being Thiruvilayadal movie. Last night, at 10-30, just before my weary head hit the pillow, I felt the need to read, or at least start reading a book. It's nothing unusual, and I'm sure that bibliophiles would be thoroughly acquainted with the feeling, and it's consequences. Although the first book in the Shiva trilogy had ended in quite a cliffhanger, I had refrained from diving into the second book until then. But for some reason, last night I picked up that one. It was 02-30 in the morning when the book was finished. I Last night, at 10-30, just before my weary head hit the pillow, I felt the need to read, or at least start reading a book. It's nothing unusual, and I'm sure that bibliophiles would be thoroughly acquainted with the feeling, and it's consequences. Although the first book in the Shiva trilogy had ended in quite a cliffhanger, I had refrained from diving into the second book until then. But for some reason, last night I picked up that one. It was 02-30 in the morning when the book was finished. I switched off the light, but sleep remained elusive for a long time. As a thundershower raged outside, I remained wrapped up in the multi-coloured and multi-textured quilt woven by Amish. has given us something similar to the legendary works of R.E. Howard, using Indian mythology to create a world that's purely fictional, and yet strangely familiar because of it's juxtapositioning of known geography onto mythical notions. Add to that a very simple language, and a proper thriller unfolding over multiple books, and you have something that's unputdownable. people who r used to LOTR or other big fantasy fiction series (specially those who want there character to be developed in front of them and r not afraid of going through so called voluminous will be highly dissapointed by this book). the book is good for the people who wants to boast that they have read a triology/fantasy/fiction saga. The evidence of the malevolent rise of evil is everywhere. A kingdom is dying as it is held to ransom Today, He is a God. Three and a half stars again- As in the first instalment, it is the plot and the pace that keep one completely engrossed, one wants to keep reading on to see what happens. The plot is very exciting, imaginative, and interesting. But my complaint with the language in the first book continues in this one- it just seems unsuited to the setting and the time- not quite right. Of course, this isn't stopping me from moving on to the final instalment. Finally I picked up this much-awaited sequel to the book ‘The Immortals of Meluha’ and, boy, I wasn’t disappointed. The sequel arrived after I had almost forgotten the plot of its predecessor, but the thrill and adventure, as well as the unique plotline made it all rush back into my brain’s core. The book begins where the previous installment ends – Shiva and Sati chasing their assailant. The adventure that starts at the first page, ends only in the last page, with adrenaline oozing out of every Finally I picked up this much-awaited sequel to the book ‘The Immortals of Meluha’ and, boy, I wasn’t disappointed. The sequel arrived after I had almost forgotten the plot of its predecessor, but the thrill and adventure, as well as the unique plotline made it all rush back into my brain’s core. The book begins where the previous installment ends – Shiva and Sati chasing their assailant. The adventure that starts at the first page, ends only in the last page, with adrenaline oozing out of every page, with some high-packed action. What if Lord Shiva was once just a normal, mortal human being but was later exalted to the status of a God due to his deeds and destiny? The trilogy attempts to weave an interesting story based on this idea and the author has done a fairly good job, considering that this is his maiden attempt in writing a book of this magnitude. The story takes Shiva, his family and friends across the country in search of the evil – or are they – Nagas and their kingdom. With so many unexpected twists in the plot, if I say anything more, I might spoil the fun of reading the book. A book like this deserves to be completed in one sitting. The book is a must-read if you are looking for razzmatazz plotline with a lot of action and adventure to pass your time. But don’t expect anything beyond that. Of course, the author gives us a glimpse of his philosophical quests in some pages and they are worth delving into. In fact, I picked up a wise thought – no one is completely evil. It is all about perspective. The book has some sloppy sides though. The anachronism over the presence of a liger – I am not certain that any ligers were around in the period 4000 BC, the people using some of the modern day swearwords and such minor issues. Also, many a while, he breaks the suspense well in advance. He ends up giving more than enough hint so that when he reveals the identity of a character, you don’t find any suspense or thrill at all. Also, Anandamayi’s advances to Parvateshwar aren’t lovely but lewd. The purity of the love that binds Shiva and Sati is entirely missing in their ‘love’ affair and this woman ends up acting like the modern day heroines who think that the only way to make a hero love them is to shed their clothes. Unsavory! But compared to the fun of the author’s idea of bringing some contemporary persona in the book – like Bappi Raj, who reminds you of Bappi Lahari, with his heavily built physique and obscenely adorning jewelry – and his commendable play around words and legends, you won’t find these glitches in anyway impeding. Part 2 of the Shiva Trilogy. Shiva continues his journey from Meluha into Swadeep, after managing to broker a peaceful arrangement between the Suryavanshis and Chandravanshis. He then shifts his focus to what he considers a common threat, and a fount of evil - the Nagas. His search for the Nagas takes him into the Chandravanshi kingdoms and brings him in touch with various populaces who have ties with the Nagas. As the book progresses, events force Shiva to reconsider his belief in the Vasudevs Part 2 of the Shiva Trilogy. Shiva continues his journey from Meluha into Swadeep, after managing to broker a peaceful arrangement between the Suryavanshis and Chandravanshis. He then shifts his focus to what he considers a common threat, and a fount of evil - the Nagas. His search for the Nagas takes him into the Chandravanshi kingdoms and brings him in touch with various populaces who have ties with the Nagas. As the book progresses, events force Shiva to reconsider his belief in the Vasudevs as well as his stance on the Nagas, and towards the end, he begins his journey into the land south of the Narmada – the abode of the Nagas. The book sees the birth of Karthik, Shiva’s son, as well as other popular Hindu mythology characters – Ganesh, Kali, Parashuram etc. The author, as with the first book, tries to find a logical explanation to the mythological portrayals, though he does take a lot of creative liberties. Book 2 also ends with revelations and a set of questions which most likely will be answered in The Oath of the Vayuputras. I felt that the prose and the style had definitely improved from the first volume, though I still found the rampant use of modern day phrases and expressions by mythological characters a put off. Once again, the narrative is paced well, and there is no dearth of imagination. I’ll definitely be waiting for the third volume and the ‘master puppeteer’. The second Novel of Amish Tripathi. This is a very serious romanticized take on a mythological figure. Shiva the god of god, a virile man in Hindu mythology provides the perfect hero to this epical narrative. At last shiva married to Sati, this is only matters to read this book. mythology provides the perfect hero to this epical narrative. Tenang ... gak bakal ngasih secuil review tentang isi buku di sini. Bahaya spoiler terlalu gede soalnya. Jadi cukup percaya saja ya, buat pecinta adegan action, setidaknya ada 7 adegan pertempuran di buku ini. Buat pecinta romance, ada satu romance unyu menanti. Buat penyuka dialog-dialog filosofis, buku ini luber deh. Nah, jika kalian penyuka misteri, jangan khawatir. Ending-nya cliffhanger. Jelas bikin penasaran kan? Btw Fiuh! Akhirnya kelar juga. Though some chapters seemed out of the flow but nearing the end,it all starts to connect. Frankly,the immortals of Meluhas was more captivating than the secret of the nagas for me. Stuffed with thrill, adventure and action, the sequel takes you deeper in the Shiva trilogy that gets better and better. The Secrets of the Nagas are really intriguing and give you more than what you’re seeking. Amish has most recently written the Shi Amish is an IIM (Kolkata)educated, boring banker turned happy author. The success of his debut book, The Immortals of Meluha (Book 1 of the Shiva Trilogy), encouraged him to give up a fourteen-year-old career in financial services to focus on writing. He is passionate about history, mythology and philosophy, finding beauty and meaning in all world religions.